Real­ized in 2012 as a perma­nent instal­la­tion in the sculp­ture park of the Herbert Gerisch Foun­da­tion in Neumün­ster, Germany. 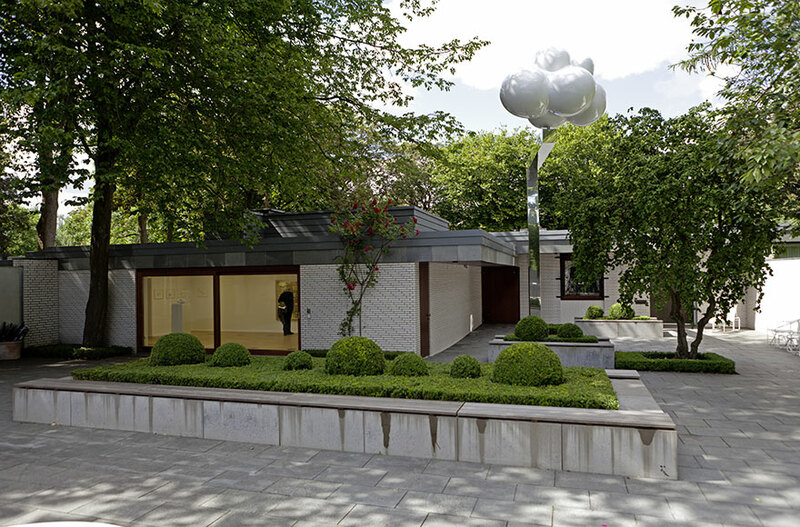 A stylised cloud made from shiny white plastic measuring 300 x 200 x 200 cm is swivel­mounted at a height of 580 cm at the tip of a 450 cm-long hori­zontal cross­beam which swings above the house. The mast and the cross­beam form a metal bracket which reaches over the roof of the house and is swivel-mounted. It is aligned by the wind and can also be swiv­elled through 360° using a handle mounted at chest height. The bracket is coated with mirror-polished stain­less steel. Cumulus 11.08 floats over the private resi­dence of the founders Herbert and Brigitte Gerisch. It is a 1960s bungalow which is shut off from the road by a high concrete wall and a metal gate and is not visible from the street. The vertical line of the cloud bracket is added to the hori­zontal line of the concrete wall so that, like a coor­di­nate system, an addi­tional space is created. 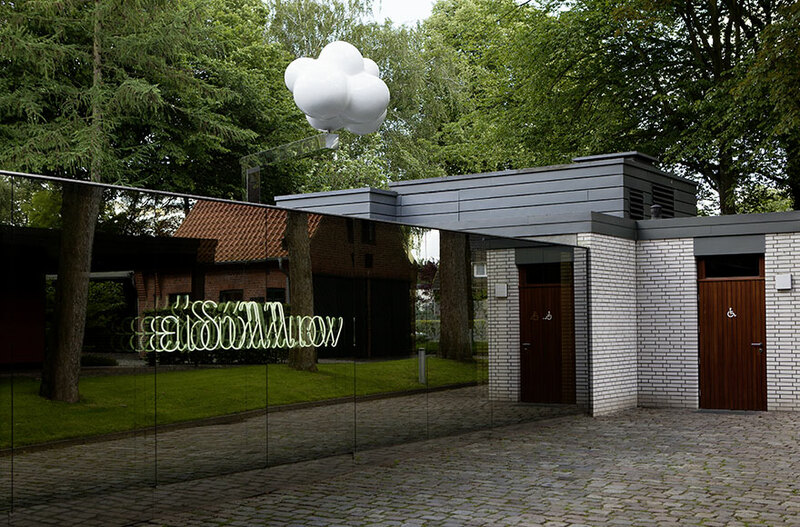 The cloud is the only indi­ca­tion of the building located behind the wall and points like an arrow on a map to the house and the Gerisch Foun­da­tion. With the cumulus cloud, also known as a heap or cumu­lonimbus cloud, Gold­berg has chosen a cloud which is univer­sally regarded as very beau­tiful: it is the classic text­book cloud (“cotton-wool cloud”), flat under­neath and shiny, white and round on top. The round­ness of the sculpture’s shape is empha­sised by its glossy white surface. Cumulus 11.08 is different from the orig­inal because of its stylised nature. The actual sky has been given this synthetic cloud as an arti­fi­cial set piece. 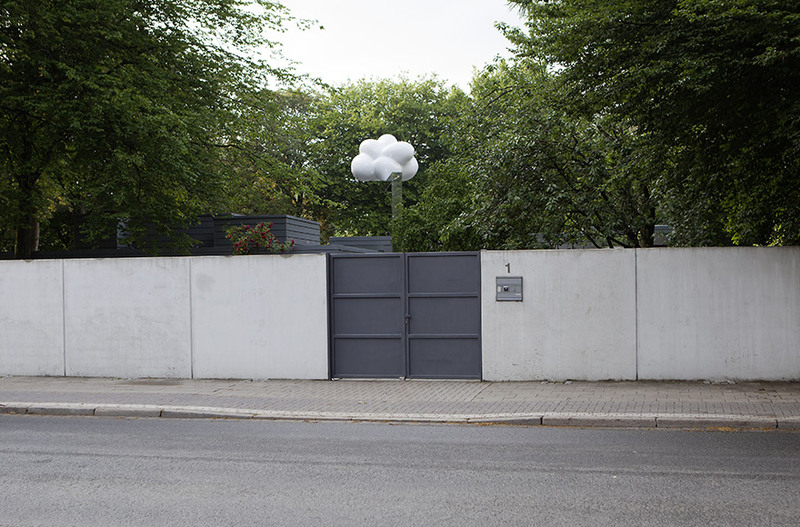 The addi­tion of “11.08” to the title refers to a cloud forma­tion photographed in August 2011: preserving this fleeting moment of move­ment has frozen it in time. Although clouds travel across the sky and one watches them lost in thought, their natural move­ment is negated. The cloud in the Gerisch sculp­ture park circles round the mast as if held by a cord. 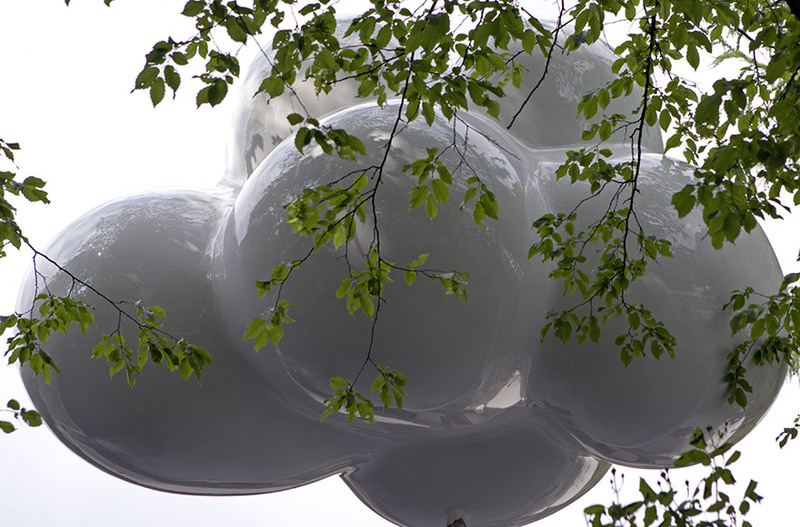 Unlike real clouds, this one is tangible and touch­able. 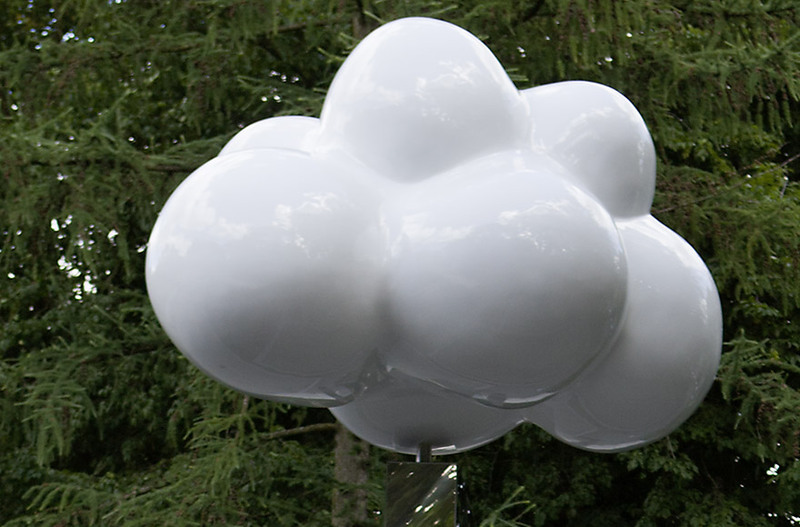 Cumulus 11.08 adds to the perma­nent sculp­ture collec­tion in the Gerisch sculp­ture park. Since 2005 the criteria for choosing new sculp­tures have been the following: do they link contem­po­rary art and land­scape? Do they examine how art deals with percep­tions of nature that are full of longing? Goldberg’s work not only inves­ti­gates the specific orien­ta­tion of the loca­tion, but also indi­vidual, histor­ical and social utopias hidden behind today’s ideas of what idyll actu­ally means to us. The clouds help us dream ourselves away from reality. We build “castles in the air” where utopian ideas and desires are located. Cumulus 11.08 is a cipher, a metaphor and, at the same time, a form of projec­tion and an image of longing.